Join us from 7:30 am to 12:30 pm on Saturday, April 27, 2019 in a tremendous volunteer event at our Madison St. and Buley Unit locations. This is part of Comcast Cares Day, a giving back and volunteering day by Comcast NBCUniversal and its local affiliates. 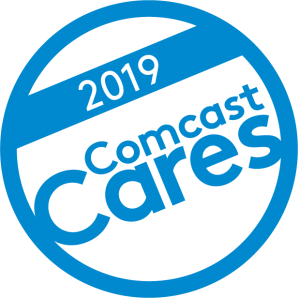 In order to volunteer on Comcast Cares Day, you must fill out this volunteer application and return it to the Madison St. unit or bring it on the day of the event. It’s that easy. Plus, Boys & Girls Clubs of Muncie receives a small monetary gift for each volunteer! All projects are around cleaning, painting, maintenance, or general landscaping at our two units: Madison St. and Roy C. Buley. These are important projects that will directly benefit our Club members in your local community. You might be asked to touch up paint around the gym or classrooms. Do you like landscaping? You might help with weeding, mulching, or planting flowers. Or you might be asked to help organize items to make the Club the best experience for the kids. Bring your friends, family, and coworkers! Every volunteer means a small monetary gift back to Boys & Girls Clubs of Muncie just for a few hours of your time. Download the volunteer application and return it to the Madison St. unit or bring it on the day of the event. Comcast Cares Day is a long-standing tradition rallying more than 6 million service hours and 10,000 projects around the world since 2001. Last year, Comcast participated at more than 150 volunteer project sites, including sites at Boys & Girls Clubs. Open the Door. Take the Tour.